The recent nomination and appointment of Brett Kavanaugh to the U.S. Supreme Court offered a timely opportunity to demonstrate how controlled digital lending can be used by libraries to circulate digital copies of books that are out of print or not widely held. The basic premise of controlled digital lending is “own one, loan one”—rather than loaning a physical book in their collection, libraries can choose instead to loan a scanned version of that book to one user at a time, while the physical book remains on the shelf. A key player during the confirmation hearing was Mark Judge, a friend of Kavanaugh’s who wrote the book Wasted: Tales of a GenX Drunk, describing his raucous, alcohol-fueled high school years. Judge’s memoir was published in 1997 by Hazelden Publishing, the publishing arm of the Hazelden Betty Ford Foundation, which runs the recovery centers where Judge was treated for addiction. The book had a limited print run and subsequent shelf life—it was not widely held by libraries outside of those focusing on addiction and recovery. Interest skyrocketed once Judge’s book entered the public consciousness, but because the book was no longer being sold by the publisher and used copies were scarce, when available at all, its price on Amazon.com topped out just under $2,000. Boston Public Library (BPL), a long-time scanning partner with Internet Archive, located a copy of Wasted in their research stacks. Those books are only available for use within the library, so the book was never going to circulate. Tom Blake, Manager of Content Discovery at BPL, sent the book down to be scanned by Internet Archive book scanners in their in-house digitization center. Internet Archive staff digitized the book using the same procedures and equipment that have been used to digitize more than 55,000 books from BPL’s collection since the partnership with Internet Archive began in 2007. Using existing workflows and post-production processes, the physical book was scanned and turned into a digital book complete with page images, OCR text, and mobile-friendly formats before being placed online at https://archive.org/details/wastedtalesofgen00judg. Wasted is currently still under copyright but out-of-print. BPL reached out to the publisher, Hazelden, to ask whether Wasted could be made available digitally without restrictions. In the years after the book was published, however, copyright had reverted from the publisher back to Judge, so Hazelden was unable to grant permission. Because BPL wanted to fulfill its mission in providing access to a book of cultural and political significance, BPL put the non-circulating copy it owns into Internet Archive’s controlled digital lending service, where it can be digitally loaned to users one-at-a-time. Books in controlled digital lending follow the same circulation patterns as those in a traditional library; a user has access to the book for 14 days, and if a book is checked out users can join a waitlist for their turn to read it. As BPL’s copy of the book was being digitized and published online, two electronic copies of Wasted were uploaded to the Internet Archive’s Community Texts collection, which does not have the same access restrictions as controlled digital lending. Instead, user uploads are governed by the Internet Archive’s Copyright Policy. One copy was noticed by Twitter users and its URL was widely circulated online, drawing considerable interest from the public and media. 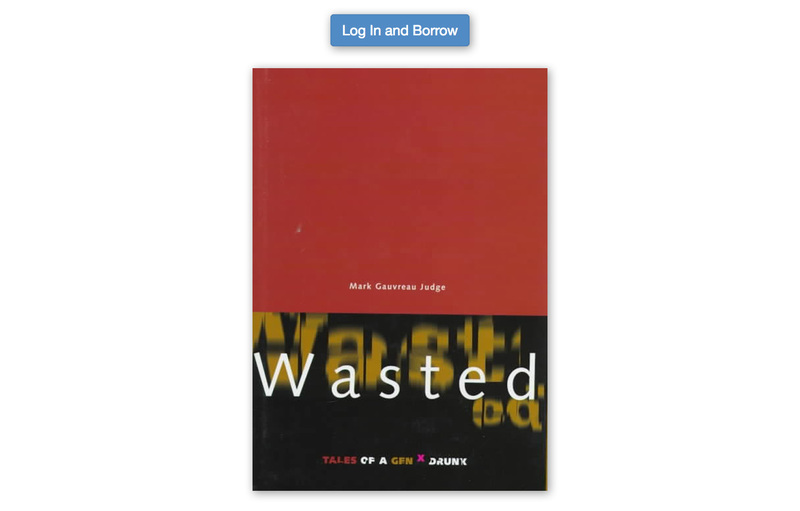 At this point, there were three copies of Wasted available: two uploaded by users into Community Texts with no access restrictions, and one scanned by BPL and available to one user at a time. During the few days that all three copies were online, several news outlets began noticing the different modes of access. Slate offered perhaps the best analysis of making Wasted available via controlled digital lending, reaching out to academics and legal scholars about the legality of the move, with the general agreement that the Archive’s actions were very likely to be legal. Mark Judge eventually e-mailed Internet Archive and requested that the copies of Wasted be taken down. Internet Archive takes prompt action on takedown requests. In this case, given that the book was out-of-print, we made an appeal to him to allow the book to be made available without restriction. Judge denied our request, as he is working on plans for the book to be republished. Ultimately, we came to agreement that only the two openly downloadable copies in Community Texts would be removed; the copy made available from BPL through controlled digital lending would remain online. Before the two unrestricted copies were taken down, they were viewed more than 27,000 times. Compare that with the 28 borrows to date that have occurred with the BPL copy, and the wait list that numbers more than 400, and you’ll quickly come to realize that for controlled digital lending to work at scale, more physical copies are needed to loan against, especially for titles like this that enter the public zeitgeist and become part of a major news story. And that’s where other libraries come in. The Internet Archive’s Open Libraries project is bringing together libraries that are committed to making their collections available via controlled digital lending and pooling their physical collections in order to make more lendable copies of digital books available to their users and the world. The takeaway here is that controlled digital lending is a viable, but limited, way for libraries to provide digital access to the physical copies on their shelves. This case study demonstrates the ways in which controlled digital lending works, and its limitations of scale for titles with wide appeal. A significant way of addressing those limitations is for more libraries to join Open Libraries and lend digitized versions of their print collections, making more copies of books available for loan and getting more books into the hands of researchers and readers all over the world. >Agrees to make his book available under a shady ‘fair use’ claim by the Internet Archive so that people can access his work for free. At what point did they say Mark Judge was evil? Also, how is the library utilizing its right to make digital access a thing shady? You do realize this this the whole purpose of this website? I do give the Archive full credit for allowing items with differing opinions on their site, though (outside of one or two possible cases on censorship that I can think of off the top of my head). I just hope that this commitment to free speech continues (not entirely confident it will given the growing censorship all around us). Really, this is part of the whole politicization of libraries/archives trend that’s been going on for the last few decades that, as an actual librarian (not a LARPer), I’m not particularly fond of. Librarians/archivists should be bureaucrats, not politicians. The IA is not as bad as the APA, mind you, but it’s close. Err, ALA. Been helping students with their citation a lot lately, and it’s beginning to confuse me. Shady? Are you seriously referring to libraries lending books as shady? ‘Shady’ as in their claim that uploading copyrighted works and lending them out is legal under some ‘we can lend out an electronic reproduction of this work because we hold a physical copy’ loophole is questionable at best. I guess the only way we’ll know for sure is if it ever ends up before the courts (hopefully not). Did I say libraries lending books is shady? Seriously, go back and read what I actually wrote. My guess would be that most of the books you lend get seen be everyone who wants to see them (long tail theory). Do you have statistics available anywhere so I can see whether this guess is right. It would be interesting to see the waiting queue distribution over all your books. As I haven’t been able to read the book myself yet, could you tell me which is the correct case? Is it just Mike Judge’s high school years, or is it his and Kavanaugh’s? The implications matter. The gatekeeping goes way beyond the stereotypical “shushing.” The librarians in my junior high schools clearly disliked having students in the library, and my high school librarian allowed herself to be co-opted by my English teacher into prohibiting me from using the library at all. The most welcoming librarian I ever had during my formative years was a card-carrying Commie who was pleased to be a facilitator; she did more to foster positive attitudes towards libraries and librarians than many who, though nominally were loyal Americans, had unwelcoming attitudes which caused much damage. [https://www.leagle.com/decision/1957166147fsupp191162]. [Ironically, I did achieve a sort of revenge against the gatekeepers in the library profession; I earned myself a MLS degree.]. I agree on making more copies available, but meanwhile it might be appropriate to automatically reduce the duration of the loan when there’s a peak of interest, just like some libraries offer 1-day or “overnight” loans. A textbook, for instance, may be in huge demand in the days before an exam or assignment, but readers may need just a chapter or few pages from it, or at any rate be done with it very quickly. All very interesting but is it worth reading where are the reviews of this book, on an alcoholic’s adventures? I recall my school days so drunk I peed on the floor while head master took morning assembly. In some respects I felt a sense of satisfaction that I didn’t get any pee on my trouser. But was given away buy other boys laughing at me. Deputy head, Mr Errol Owen, told them off of course and rightly so; naughty boys laughing at me. Looking back I never really enjoyed being alcoholic but did have some laughs was not all misery.